While wildlife in Alaska is frequently seen, early season (May & early June) and late-season (September) departures offer even greater opportunities for viewing a variety of wildlife. Departures after mid-August will enjoy blazing fall colors. Your Train: The Alaska Railroad travels through Alaska’s spectacular scenery. Globus has obtained a complimentary upgrade for our guests in Deluxe Dome Service, which features confirmed seats in the upper-level dome car; priority seating in the dining room; and a private outdoor viewing deck. Experience the Northern Lights: Enjoy the chance to witness the spectacular aurora borealis (Northern Lights) when the aurora dances across the horizon and lights up the sky. An amazing opportunity! The best chances of viewing the Northern Lights is on late August and September departures (if Mother Nature permits). Meet your fellow traveling companions at this morning’s welcome orientation. Travel through Palmer in the Matanuska Valley, where cabbages can grow to an amazing 70 pounds in the 24-hour daylight. 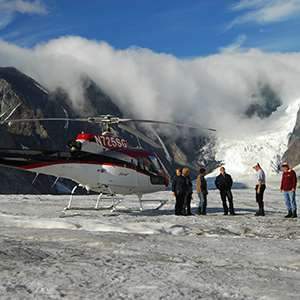 Venture up over Tahneta Pass for wonderful vistas of Matanuska and Worthington Glaciers. Stop at Bridal Veil Falls before arriving in the seaside port of Valdez, often referred to as the “Switzerland of Alaska.” Before dinner tonight, enjoy a special PRESENTATION by a local fishing expert. Learn more about the Alaska fishing industry, the equipment used, and the daily lives of these fishermen. Board your boat for a CRUISE on Prince William Sound and along the 3-mile face of Columbia Glacier, keeping a watchful eye out for wildlife, including seals, sea otters, birds, and even whales! Before returning to Valdez, see the Trans-Alaska Pipeline Terminal, where supertankers are loaded with crude oil from Prudhoe Bay. Enjoy great scenery all the way as you travel along Richardson Highway. Stop at DELTA JUNCTION, a living history homestead with a museum, original roadhouse, and farm animals. Then, head west on the Alaska Highway to Fairbanks, the state’s second-largest city. Visit GOLD DREDGE #8 and ride the narrow-gauge railroad. Then, try your luck as you pan for gold. Later today, board the sternwheeler DISCOVERY for a cruise on the Chena and Tanana Rivers, with a stop at the Chena Indian Village to learn about Athabascan Native culture. You will also have the chance to meet Iditarod mushers and their famed dog teams to learn about breeding, training, and the big race! This evening, enjoy a special Alaska SALMON BAKE. Board the world-famous ALASKA RAILROAD for a journey through untamed wilderness. Today’s ride ends at DENALI NATIONAL PARK, where North America’s highest peak, 20,320-foot Denali, (formerly known as Mount McKinley) majestically dominates the park’s 6 million acres. The afternoon is free. This evening, enjoy dinner at the Murie Science & Learning Center followed by an exclusive PRESENTATION on Denali National Park by a local Naturalist. Continue your exploration of Denali National Park as you head south toward Anchorage. 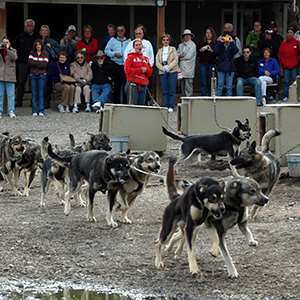 Stop along the way at HAPPY TRAILS KENNELS, home of four-time Iditarod Champion Martin Buser and his dogs. Meet an Iditarod competitor and learn how they race and care for their dogs. You will also see a demonstration on mushing, complete with a mock Iditarod checkpoint, and get a chance to play with the sled dogs! This evening, your Tour Director hosts a special farewell dinner. Over dessert, enjoy a special PRESENTATION by an Alaskan bush pilot. Witness one of the world’s most scenic drives as you follow the south shore of lovely Turnagain Arm. 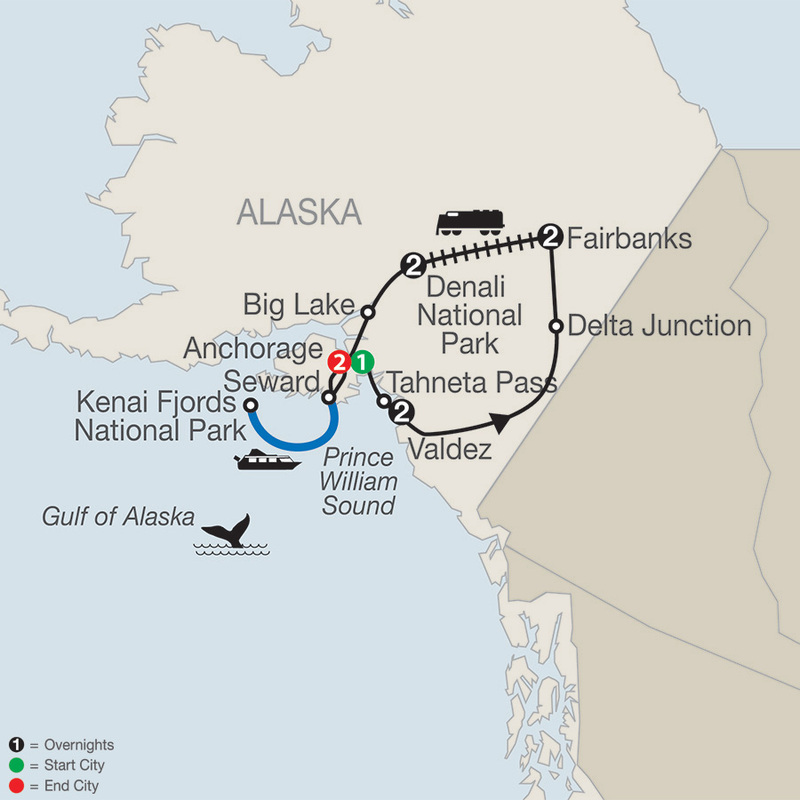 Upon arrival in Seward, board your vessel for a cruise of KENAI FJORDS NATIONAL PARK and the opportunity to see glaciers calving into the sea, orcas, humpback whales, sea otters, and more! 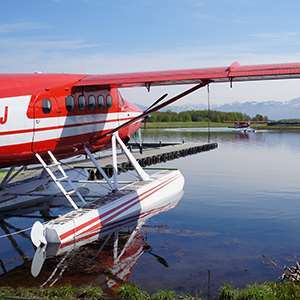 In a state where airplanes are a way of life for so many residents and almost as common place as taxis are in New York City, experiencing Alaska from the air is a wonderful way to discover this magnificent region. Soar high above the mountains, lakes and glaciers, getting a birds eye view of this vast landscape.